We have begun work building a depot at the Craggy Mountain Line. The Craggy Mountain Line extends a special thank-you to all those who have helped with the restoration of this historic rail line. In December 2012 the Craggy Mountain Line held our first Jingle Bell Run trolley train ride. 1950 Alco Engine from the Alexander Railroad. We have created a replica of a rare car from the Tweetsie Railroad. The American Car & Foundry Co built subway car no. 983 in 1935. The car is more than 60 feet long and weighs just under 84,000 pounds. Built for the Carolina Power and Light Co, the 119 was built in Philadelphia by the Brill Manufacturing Company in 1927. 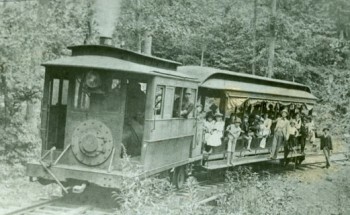 It was purchased by the CP&L Co and ran for only 8 years when it was retired in 1934. Built for the Chicago Burlington & Quincy Railroad, the 9505 was built in Sanford North Carolina by the Edwards Motor Car Co. These photos show some of our restoration work on the 488 caboose for the Craggy Mountain Line. 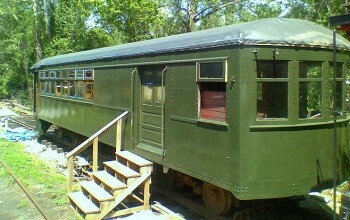 These photos show some of our restoration work on the 582 caboose for the Craggy Mountain Line. The CML has several pieces of rolling stock we have been restoring. Here is some of our equipment, including freight cars. More track improvements at the CML with our great volunteers and some of the guys from the NCTM track department. We are happy to announce that phase 3 of our track work has finally begun. Here are some of the photos. Thank you to all of the volunteers who helped! Work on the Craggy Mountain Line tracks from August 2010 to February 2011. The Craggy Mountain Line began work on upgrading our track in January 2008.